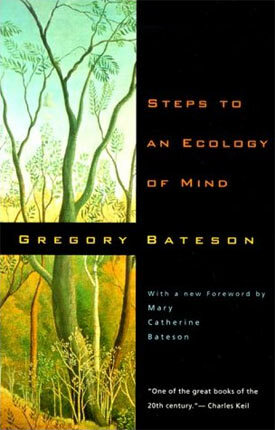 3 responses to "Steps to an Ecology of Mind"
Sounds like a must for me. In a similar vein to the “psychoanalysing groups” bit, I’ve just read the Ramsey Dukes’ brilliant Little Book of Demons. He’s talking about the magical technique personifying problems (e.g. runs of bad luck, or a broken photocopier) as demons in order to relate to them and strike deals with them. What’s interesting is his main explanation as to why this should be effective and not just some regressive superstition. He argues that our most powerful cognitive abilities relate to social interaction (and indeed many current theories see the monkey brain as having expanded so much on its way to us as a result of the need to cope with larger groups and more complex social interactions). So, the idea goes, if you personify something – whether it’s abstraction or something material that isn’t human – it’s like flipping a switch to bring all that social sophistication to bear on your relationship to it. This reasoning makes me wonder if I’m human sometimes – am I really the inheritor of anything like “social sophistication”?! But in general it’s persuasive. Slightly different to the Bateson thing, but another reason why using analysis meant for individuals might also work well for groups. As humans function together in bigger and bigger groups some character traits get magnified and concentrated, and others diluted, which I suppose is why nation-states and large corporations often act like single-minded psychopaths, displaying an indifference to ethical considerations that very few individuals could otherwise manage. What’s the problem with reductio ad absurdam? Is he advocating intuistionistic logic? In some spheres I guess it’s appropriate, but from a technical point of view, I really can’t be arsed with it. displaying an indifference to ethical considerations that very few individuals could otherwise manage. I believe it goes far further than that Larry. I would argue for instance that Israel is a nation suffering from paranoid psychosis as a direct result of amplified post-traumatic stress disorder. Bateson doesn’t say that, but he does offer a coherent justification for describing a non-human mind in terms usually applicable only to humans. And a reason why the tools of psychoanalysis can be of use when dealing with non-human minds. With regards to reductio ad absurdum, it’s merely that he uses “cybernetic thinking” (analysis by ‘restraints’) to illustrate proof by reductio ad absurdum in a way which cleared up a misunderstanding that I’d always had. He builds conceptual bridges and links between disciplines and ideas that are both breath-taking and – only in retrospect – very obvious. And you have to like a collection of papers that includes one entitled: On Empty-Headedness Among Biologists and State Boards of Education.